The third Monday of the month has come and gone, and for the second month in a row, we opted not to host our usual open mic. Don’t worry. We’re not getting lazy and Proyecto Latina isn’t going away! In fact, we’ve been busy making plans to revamp our whole project, to boost our online content and to create a workshop series designed to help Latina artists build skills and new material. We started Proyecto Latina 7 years ago, as a way to provide a place where Latina writers could come together and share their work in an encouraging and accepting environment. We believed then–and still believe now–that whether you are writing books or scribbling your thoughts on papelitos whenever you can grab a minute, that Latina voices matter. In the past we’ve featured artists on the whole range of the professional spectrum, and we’ve expanded our mission well past writers. We’ve featured playwrights, performance artists, curators, visual artists, academics, activists, actresses, and organizers. We’ve created a website that helps us with our goal of amplifying Latina voices. And we’ve collaborated with other reading and performance series to help build community and networks. And in all of that time, with all of that growth, our live format remained the same: a featured artist and an open mic. As much as we loved these monthly events (80 in total!) we started to wonder if this format was the best way to serve Latina artists? So our live events are on a brief pause as we strategize new ways to be a resource and a home for Latina women. In the meantime, you can still find us posting online and make sure to like us on our Facebook page and follow us on twitter so we can share resources and ideas with the Latina community. In August, we’ll kick off a monthly writing group (followed by drinks and chisme), and we’re collaborating with FMEL on an event that highlights the work of Mexican artist Amanda Gutiérrez. In January, we’ll start a brand new workshop series, based on your feedback and ideas. Oh! Speaking of your feedback and ideas… in the next few days, we’ll be sending out a brief survey. Please take a few minutes to answer, and we promise – we’ll pay attention! And if you’d like to help us with our revamp, let us know! We’d love to work with some new collaborators! 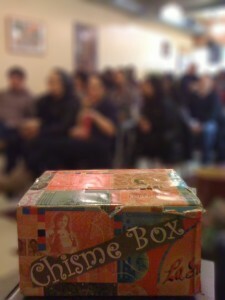 As for the chisme box, don’t worry about her. Ole girl has a few secrets up her sleeve….